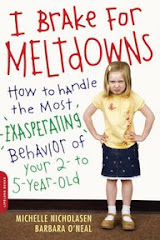 I Brake For Meltdowns: Worst Decision of 2009? Did your child ever want to drink his juice with an eyedropper? Or a melon baller? Mine do. Tell me I'm not alone here. I wondered if titrating little droplets onto your tongue would enhance the flavor, so I tried it. Nope. But it does make the juice last longer. Why is it a bad decision? Drops fall everywhere and drizzle down the front of the slurper's shirt and flick onto the floor. An eyedropper is also portable. You can scatter drops pretty widely. I can play the "blame the parent" game by reasoning with myself that I failed because 1) I didn't put that dropper out of reach, and 2) I wasn't in the mood for a tantrum when I took it away. If you think this is weird, just wait until you see the other stuff we let our kids do.